Winter cauliflower is nothing short of amazing! We planted a whole bunch of different varieties this year trying to figure out what does well for us. I’ll post the results on that sometime next month. 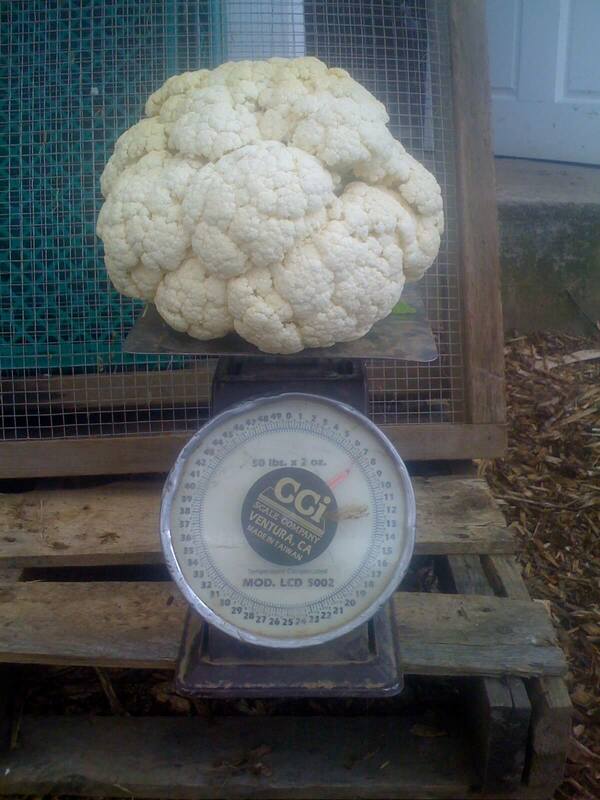 More important I wanted to put this photo up of our gorgeous SEVEN POUND cauliflower head!! Thanks Matt for capturing this beast on film! Below is a great cauliflower recipe recommended by my friend Lane Selman. She is part of the OSU team that is helping us with variety trials and she also works at the downtown farmers market for Gathering Together Farms. How she find’s time to cook too is beyond me! Based on Jamie’s Italy cookbook…. This is an absolutely delicious recipe. It’s quite unusual, and the best thing about it is that it makes a hero of the much-underloved everyday cauliflower. If you’re down at the farmers’ market, or at the supermarket, have a look around for a Romanesco cauliflower – it’s a similar size to a normal cauliflower but spiky and green. It also has a delicious flavor. The reason I love this dish is because it takes some all-time classic ingredients and puts them together in a great way. In Britain we normally eat cauliflower baked with cheese, and in Italy it is baked as a parmigiana with cream, cheese, and anchovies. All these flavors are in this risotto, with the added bonus of really crunchy chili pangrattato sprinkled on top – it gives an amazing kick. Whiz the bread in a food processor with the anchovies, the oil from the can, and the chilies. Heat a frying pan with a splash of oil and fry the flavored breadcrumbs, stirring and tossing constantly until golden brown.